These pages record perhaps the slowest traverse of this famous trail across the South Downs of southern England. But there is a reason. I walked the route with my son Matthew, who was only 7 years old when we started, with five mile days once or twice a year. 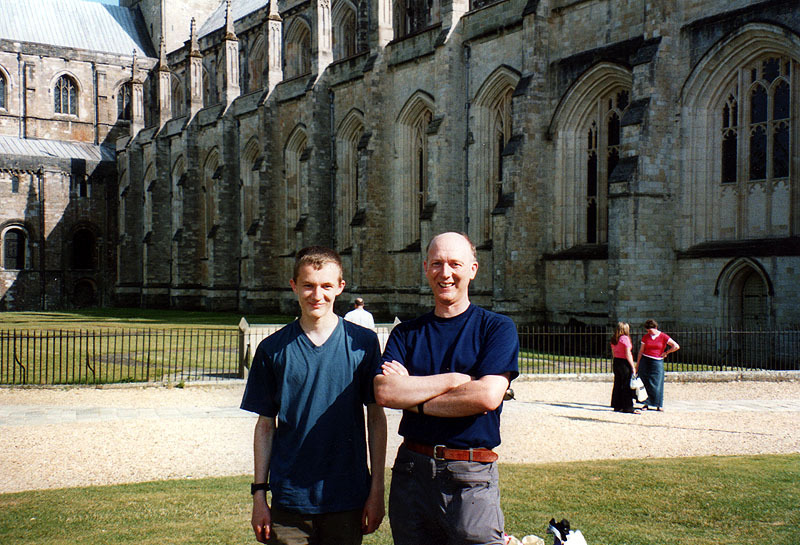 On completion, aged 14, Matthew could do full 14-mile days. 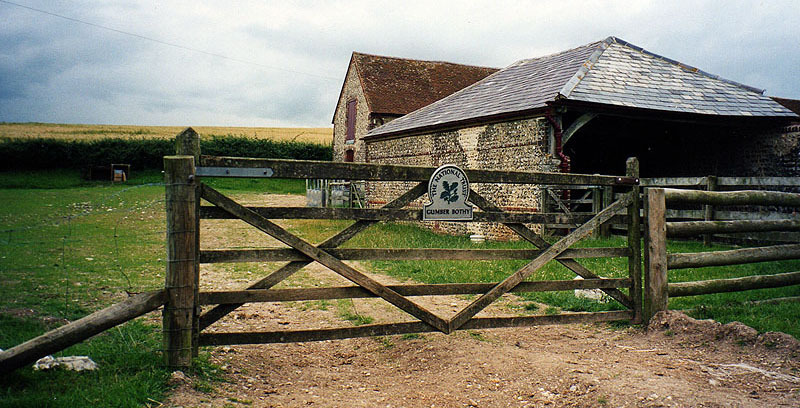 The South Downs Way makes a good introduction to walking for children for several reasons. Because many road and rail routes cross the Way, it can easily be broken into short stages. The weather in Sussex and Hampshire is as good as any in Britain. For almost its whole 100 miles, the Way follows the scarp slope of the South Downs, giving good views in all directions. Gradients are gentle yet there is a clear impression of height. The Downs are chalk hills, so much of the Way rarely gets muddy (though for many children that may not be not a bonus!). Two contrasting towns form the start and finish: Eastbourne and Winchester. The one a creation of the dicovery of the merits of sea-bathing two centuries ago, the other woven in to the ancient history of England, in which even its splendid cathedral is still a newcomer. The two county seats of Sussex, Lewes and Chichester, lend their influence to the Way, and are well visible, but both are skirted, as is Sussex’s modern city, Brighton & Hove. So unspoilt are the South Downs that there is scarcely a duff settlement anywhere in 100 miles, despite the best efforts of infilling. East Dean and Alfriston get us off to a good start, but if anything these are misleading; for relatively few settlements are encountered directly. There’s a simple reason for this. Wherever it can, the Way follows the northern scarp of the Downs, by definition its highest part. With chalk hills especially, the essential for habitation – water – lies below the scarp. So what you will find is that the villages lie a mile or two from the Way, often to the north. It tends to mean that this is where refreshment lies too, though there are some good pubs to seek out directly on the Way. The map below is taken from one of my favourite bookmarks! It only shows though the seaward variation out of Eastbourne; there is also an inland loop to Alfriston, which I walked (on my own!) in 2017 for completeness’ sake. Eastbourne and Winchester both have main rail stations with regular services to London. 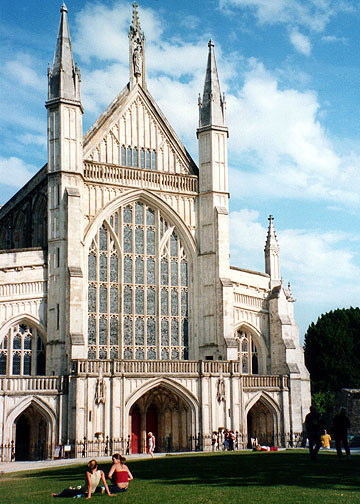 Winchester is also on the cross-country route to the midlands. Southease and Amberley stations are right on the Way. You cross over the main lines to Brighton and Portsmouth – literally over, both are in tunnels where the Way would cross. There are many useful bus services, including routes to Beachy Head, Alfriston, along the A27, A23 (Pyecombe), A24 (Washington) and A29, Devil’s Dyke, Cocking, South Harting, Buriton, QE Country Park (seasonal) and Exton. These can be surprisingly frequent – Cocking to Chichester every half hour on weekdays – but it’s as well to plan in advance, for example through Traveline. For many stages we used public transport out of and back to London. Sometimes we had lifts, for example en route to family trips to Matthew’s grandparents, who live a couple of miles south of Devil’s Dyke. Only twice did we stay overnight on the Way – at the splendid Gumber Bothy, and one pub night in Buriton. However the SDW is well supplied with accommodation, including youth hostels still, as well as many B&Bs and grander places in most of the villages along the Way, and in all the towns within easy reach. While we were walking the Way, the first murmurings of a campaign to have the South Downs confirmed as a National Park were stirring. They finally bore fruit in 2009, and with luck the character of this delightful region will now be secured for future generations. Rather depends though on intrusions like fracking, now permitted in all national parks by a Tory government act of 2014, being prevented by public will.